Geek Deal of the Day! Bond 50: The Complete 22 Film Collection Blu-ray!!! Only $99.99!!! Here is one of the better Geek deals we have posted. This one is for an extreme limited time. This sale will end at midnight. 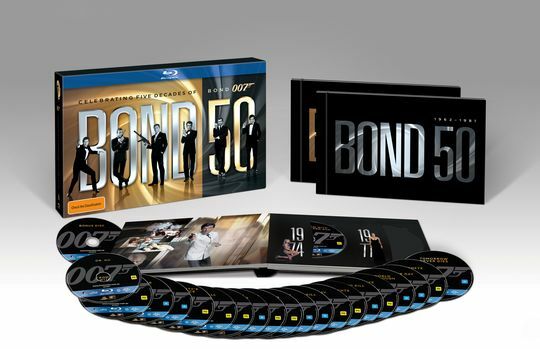 For less than $100, you get all 22 Bond films on blu-ray, with a space for the new film ‘Skyfall’. In addition to the many extras on each disc, there are exclusive extras that take you deeper inside the world of 007. This is one hell of a blu-ray deal, which is 67% off through midnight. Take advantage. The World of Bond – the 007 films have a look, style and attitude that is signature Bond. From the cars, to the women, to the villains and even the music, Bond films stand apart. The World of Bond takes the viewer through the best of five decades worth of classic James Bond in one thrilling montage. The World of Bond showcases the fascinating and entertaining interplay among unforgettable moments of danger, seduction, adventure and a dash of that distinguished humor that fans have cherished from the beginning up until now. To add to the experience, The World of Bond featurette will also offer a Pop-Up Trivia option to challenge even the sharpest of fans with little known facts and interesting trivia from the Bond Universe. Being Bond – there’s only one James Bond – but he’s proven too much for only one actor to play the role. In the franchise’s 50-year run, six distinguished actors have taken on the part and secured a spot in cinematic history. Sean Connery, George Lazenby, Roger Moore, Timothy Dalton, Pierce Brosnan, and Daniel Craig each reflect on the impact and importance of taking on such a famous role. With this piece, gain insight into what each actor brought to the character and discover how they shaped the world’s most timeless secret agent. SKYFALL Videoblogs – Behind-the-scenes look at the making of SKYFALL from the cast and crew. Vintage James Bond Films Might be Headed Back To The Big Screen in 3D!!! This entry was posted on Saturday, November 24th, 2012 at 10:27 am	and is filed under Film, News. You can follow any responses to this entry through the RSS 2.0 feed. You can skip to the end and leave a response. Pinging is currently not allowed.